Metatarsal fractures present in two basic categories: stress fractures and traumatic fractures. Metatarsal stress fractures occur as the result of repetitive load applied to the bone in an amount or at a rate that is greater than the ability of the bone to repair itself. Traumatic metatarsal fractures, on the other hand, are due to an abrupt force resulting in fracture. The force associated with a traumatic fracture is usually a fall, crush injury or motor vehicle accident. 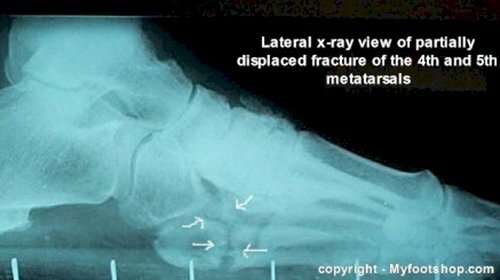 Treatment of metatarsal fractures depends upon the location of the fracture, apposition of the fracture, and alignment as seen on x-ray. Treatment may be conservative or surgical. Metatarsal stress fractures are also known as march fractures. The term march fracture comes from military exercises or marching. Metatarsal stress fractures are most commonly seen in the second and third metatarsals. Stress fractures are less commonly found in the 4th and 5th metatarsals. Stress fractures of the 1st metatarsal are rare. Each of the metatarsal bones are very strong when load is applied in a usual and customary manner, but when load is applied in an abrupt or atypical manner, the bone is unable to sustain the load and fractures (breaks.) The central three metatarsals tend to accept load as a group, while the 5th metatarsal often acts independently of the central 3 metatarsals. As a result, it is not unusual to see several fractures of the central three metatarsals at the same time. Also, the fifth metatarsal shows fracture patterns that are unique to that one specific bone. Traumatic metatarsal fractures of the central three metatarsals occur as the result of a fall where the foot is caught in a fixed position as the central mass of the body changes direction. Examples include an unseen hole in the ground or a foot that is caught under a pallet at work. 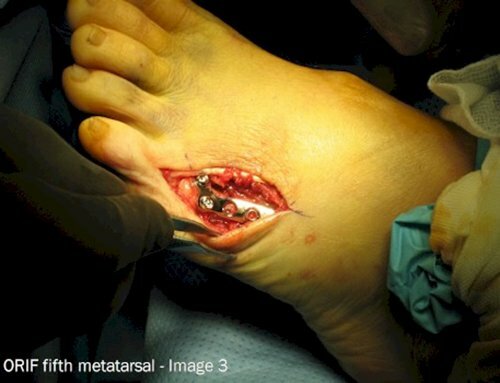 Crush injuries of the forefoot often result in traumatic fractures of the metatarsals. Crush injuries have no reliable pattern of metatarsal fracture and result in individually unique fractures. Examples of crush injuries that result in metatarsal fractures include auto accidents or dropping heavy loads on the forefoot. Lisfranc’s fractures are fractures of the metatarsal bases. Jacques Lisfranc de St. Martin (1790 -1864) was a 19th-century French surgeon in Napoleon's army who studied fracture patterns found when a person fell from a horse and was drug by the horse with their foot still in the stirrup. This abrupt force resulted in fracture patterns that would partially or completely dislocate the metatarsal bases from the cuneiform bones. The most common metatarsal fracture in a Lisfranc's dislocation would be a fracture of the second metatarsal base. 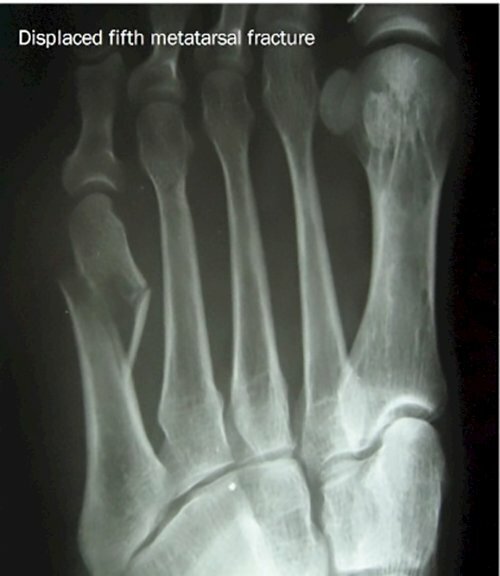 The 5th metatarsal is unique in that it alone displays a number of fracture patterns not seen in the lesser metatarsals (2-4). The most common 5th metatarsal fracture is a spiral oblique fracture of the mid-shaft of the metatarsal. A recent study found an exceedingly high number of oblique fractures of the 5th metatarsal on Martha’s Vineyard. Subsequently, these fractures have recently been called Vineyard fractures. An oblique midshaft fracture of the 5th metatarsal occurs in inversion sprains where an abrupt load is delivered to the outside (lateral) foot. 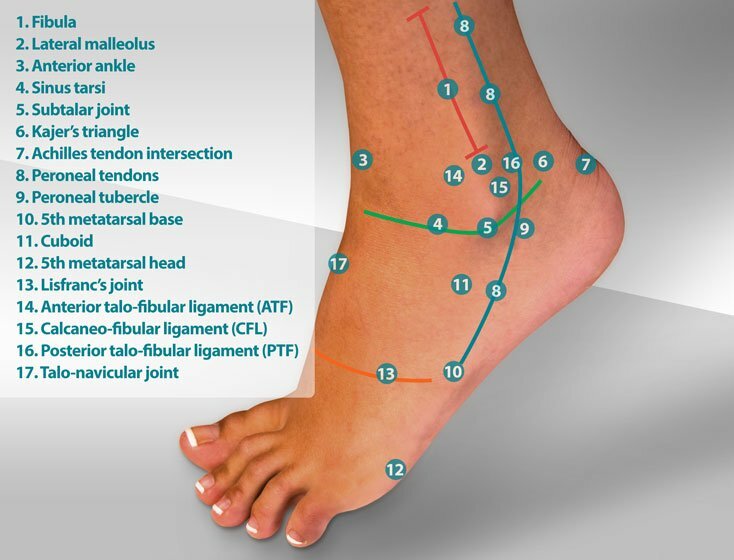 With the foot slightly adducted (pigeon-toed), the body weight is carried over the lateral foot resulting in an unsustainable load applied to the 5th metatarsal. Jones fractures are fractures of the 5th metatarsal base that occur more than 1 ½ cm distal to the base but are not considered to be mid-shaft. Jones fractures are usually transverse and appear on x-ray to be perpendicular to the long axis of the metatarsal. 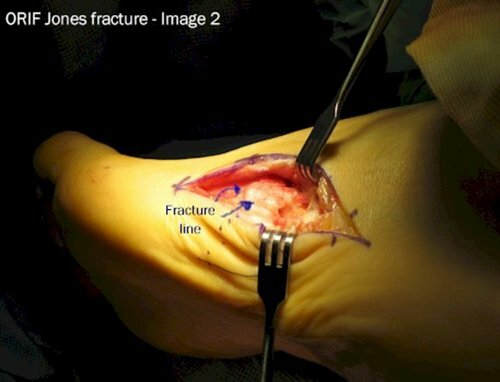 Jones fractures also occur by adduction of the foot and rolling the ankle to carry the body weight over the lateral aspect of the foot. 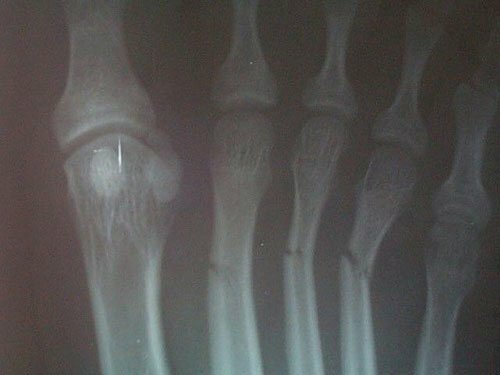 Avulsion fractures of the 5th metatarsal are fractures that occur as the result of a tendon or other structure pulling away from the bone and taking a small piece or pieces of bone with it. Avulsion fractures of the 5th metatarsal occur when the peroneus brevis tendon pulls on the base of the 5th metatarsal. The size of the avulsed piece of bone does vary but is typically less than 1 cm in size. 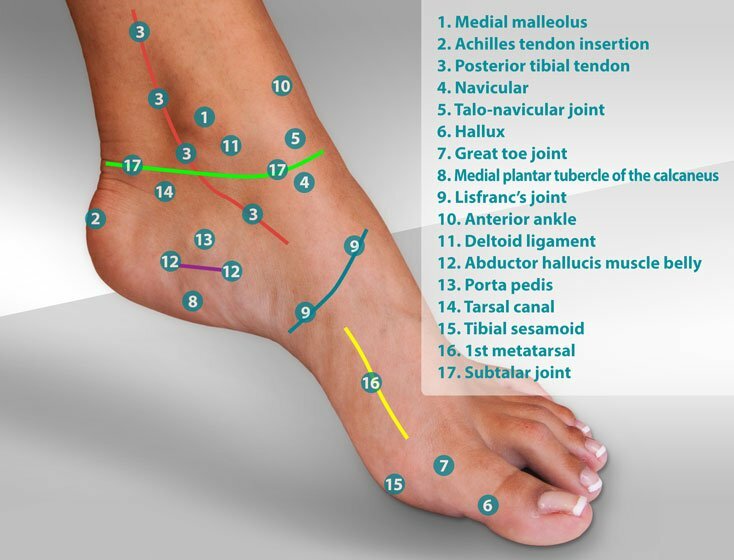 The term dancer’s fracture is applied to a number of different 5th metatarsal fractures. 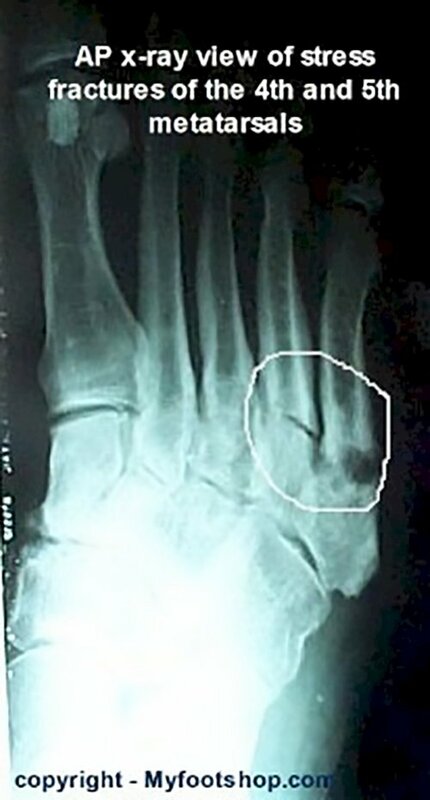 Classically, the term dancer’s fracture has been used to describe a spiral oblique fracture of the distal 5th metatarsal. Others refer to a dancer’s fracture as an avulsion fracture or Jones fracture. Due to the ambiguity of the term dancer’s fracture, it may be best to simply avoid this term when discussing 5th metatarsal fractures. Contributing factors to metatarsal fractures include obesity, osteoporosis, and high-risk activities such as riding 4-wheelers or motorcycles. Diagnosis and treatment of a metatarsal stress fracture requires a high degree of suspicion. X-rays are unreliable in early metatarsal stress fractures and are not helpful in actually confirming the fracture until 4 weeks post onset of symptoms. At this stage, the healing of the fracture called bone callus is seen on x-ray. 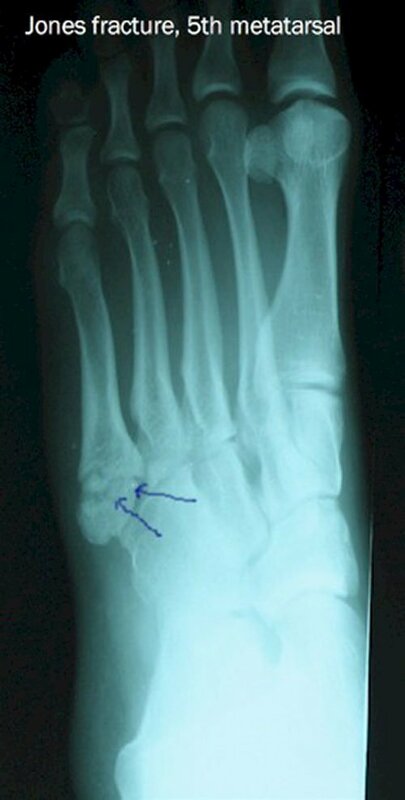 In some cases, stress fractures of the proximal metatarsal cannot be seen at any stage of healing with x-rays. An MRI is needed to determine bone edema, or swelling, to confirm the presence of a fracture. An MRI study would be indicated if there was a suspicion of stress fracture that has not responded to 6-8 weeks of conservative care. Initial treatment of a metatarsal stress fracture includes rest, ice, and the use of an anti-inflammatory medication. 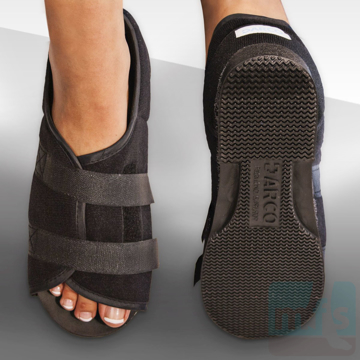 Limitation of the forefoot while walking can be accomplished with a fracture shoe, cam-walker walking cast or carbon graphite insert. Swelling can be compressed with a forefoot compression sleeve. The duration of time that it takes to heal a metatarsal stress fracture can vary. 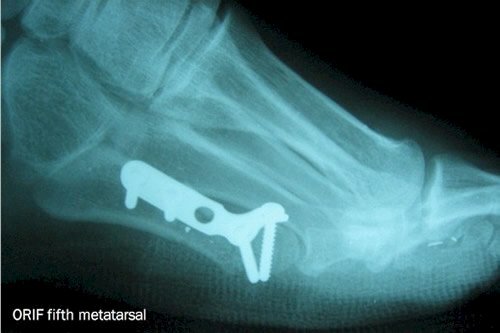 The most common metatarsal stress fracture found at the surgical neck of the metatarsal does tend to heal within 6-8 weeks. 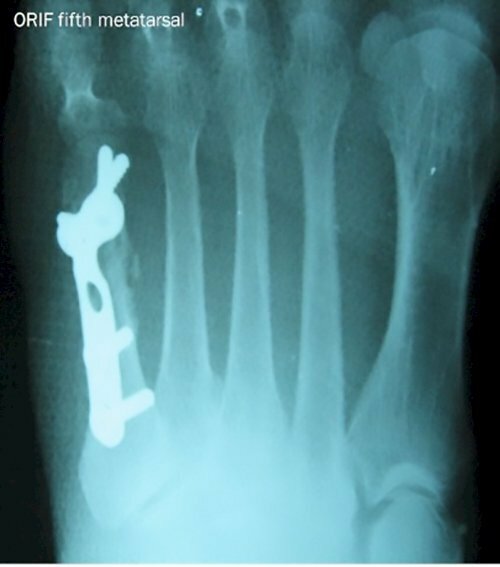 Metatarsal stress fractures at more proximal locations in the metatarsal tend to take longer to heal and can take up to 8-12 months to become asymptomatic. It's not uncommon for runners to become frustrated due to the return of symptoms of a metatarsal stress fracture when increasing activity from walking to running. 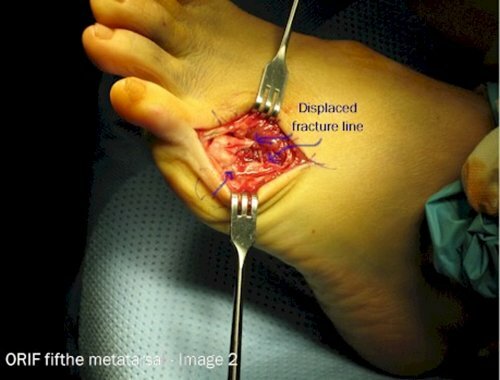 Fracture patterns of traumatic metatarsal fractures vary, so conservative and surgical care cannot be the same in each case. When dealing with fractured bone, the key to decision making hinges upon the apposition and alignment of the fracture. To heal, bone needs to be well-apposed. It can be well-apposed but be in bad alignment. 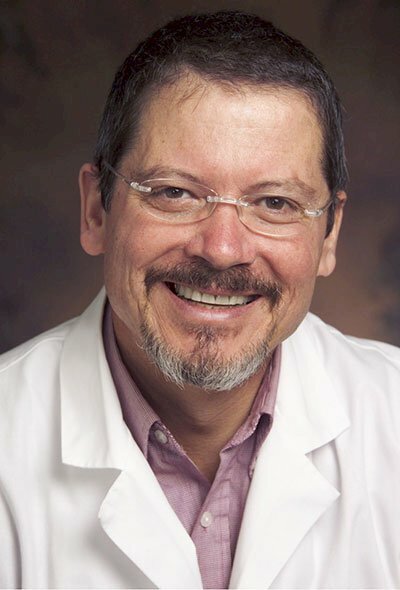 The decision to treat with conservative care vs. surgical care hinges on apposition and alignment of the fracture. Stable metatarsal fractures with good apposition and alignment can typically be treated with a period of immobilization with casting. 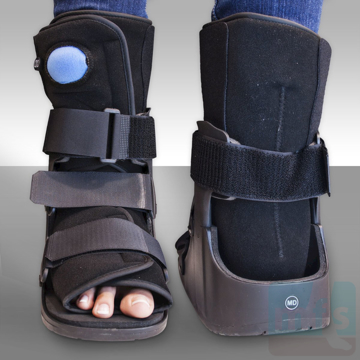 Depending upon the nature of the fracture, casting may be in a walking cast or may require a period of non-weight bearing in a hard cast. Periodic x-rays are taken to confirm the progress of healing. Unstable fractures, or those fractures that show evidence on x-ray of poor apposition or alignment, will require surgical correction called ORIF or open reduction with internal fixation. Techniques vary and may include the insertion of a screw, straight K wire or plate. 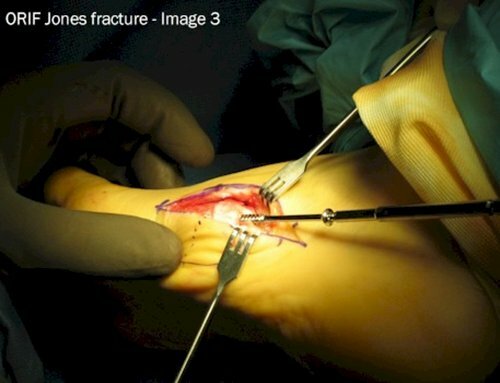 Healing of fractures depends upon the success of the surgery and the stability of the fixation. Most cases of ORIF will require a period of several weeks of non-weight bearing in a hard cast. The following images show the ORIF of a distal oblique fracture of the 5th metatarsal. The first two x-ray images show poor apposition and alignment of the fracture on x-ray. The second two show post-op correction of the alignment. Image 1 shows exposure of the fracture. Image two shows stabilization of the fracture with a K wire. Image three shows the plate in place, and image 4 shows final closure. This procedure was done on an outpatient basis under local anesthesia with sedation. The procedure took approximately an hour to complete. 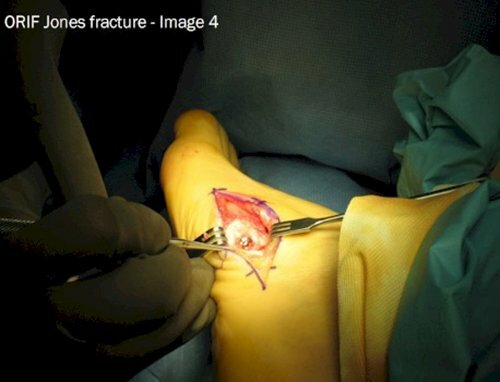 The post-op course of treatment would include 6-8 weeks non-weight bearing in a hard cast. The plate will need to be removed in a second surgery 4-6 months post-op. The following images show ORIF of an avulsion fracture of the 5th metatarsal. This particular fracture had initially been treated with casting but failed to heal. At twelve months post-fracture, the ORIF was performed. Pre-op x-rays show fragmentation of the fracture with evidence of non-union. 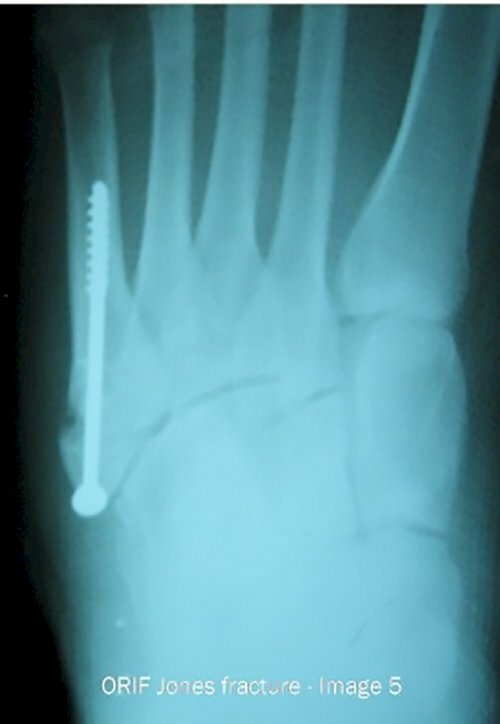 The post-op x-rays show reduction of the fracture with a single 3.5 mm screw. 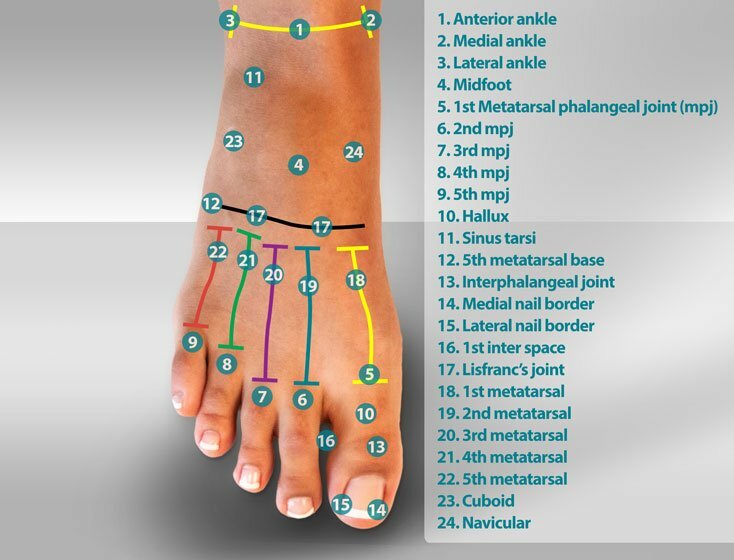 All metatarsal fractures should be evaluated by your podiatrist or orthopedist. Most recent article update: December 6, 2018. Metatarsal Fracture by Myfootshop.com is licensed under a Creative Commons Attribution-NonCommercial 3.0 Unported License. The Carbon Graphite Shoe Plate - Flat stiffens shoes and protects the foot from puncture injuries. Placed under an existing insole, the shoe becomes more rigid, limiting motion in the mid-foot and forefoot. See sizing information below. Sold individually left or right, not as a pair. By Myfootshop.com. 1 plate/pkg.